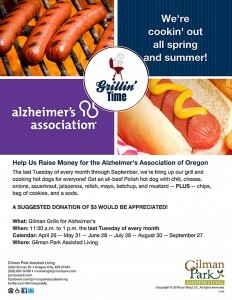 Help Us Raise Money for the Alzheimer’s Association of Oregon. The last Tuesday of every month through September, we’re firing up our grill and cooking hot dogs for everyone! Get an all-beef Polish hot dog with chili, cheese, onions, sauerkraut, jalapenos, relish, mayo, ketchup, and mustard — PLUS — chips, bag of cookies, and a soda! This month we’ll be setting up the grill on Tuesday, June 28.